An understanding of the Main Stages of waste decomposition. Which is alternatively called “the waste degradation process” is essential to understand how a landfill will gradually change over many years. We are often asked how many years will it take before a particular landfill can be built upon, or will no longer require leachate treatment? The inability of landfill professionals to provide a quick question often surprises questioners. Unfortunately, there are so many reactions which coincide within a landfill that predictions are hard to come buy. There are many sites on the web that give periods for different materials to rot away, with apparent confidence. Our view is that most such predictions that we have seen, are too short, and so generalized as to be meaningless. 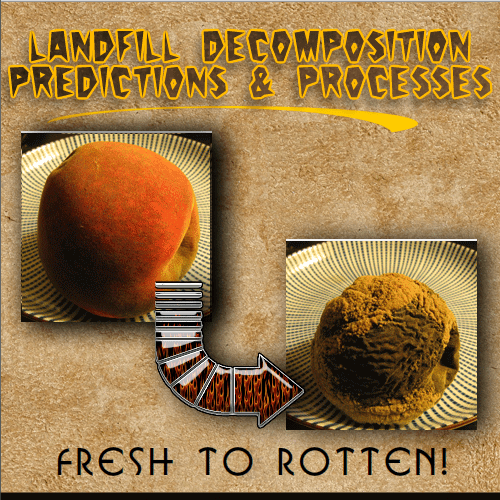 We hope that this article will help provide readers with an understanding of the difficulties in the prediction of landfill degradation rates. Forecasting when all the processes involved will have run their paths and degradation have been completed depends on the processes of decay involved. These vary according to many environmental factors, and especially according to the presence or not, of oxygen. Furthermore, even after degradation processes have significantly ceased, many landfills will still need further flushing with water. Flushing with fresh water will be needed before the leachate produced becomes innocuous and harmless to the environment. Peach Decomposes Time-Lapse Photo. From Wikipedia – Licensed under the Creative Commons Attribution-Share Alike 2.0 Generic license. Society’s experience with the present designs of sanitary landfills is very short. Over the past thirty to forty years the increasing size/more rapid filling and improved containment/capping of landfills, has led to progressively higher waste densities and lower water contents. This has has, no doubt, massively extended the degradation periods of landfills. would be quite rapidly degraded and rendered harmless; if not in 10 years, within a few tens of years. Large modern landfills, are normally kept as dry as possible, and capped quickly in order to comply with leachate management procedures. These seek to minimise landfill leachate production to reduce leachate disposal costs during the active life of the landfill. This is the same for the new (Post: implementation of EU Landfill Directives) generation of mono-disposal hazardous waste landfills. All of them will take thousands of years to decompose to the point where all pollution potential has been neutralised. The first point to note about the decomposition of landfills is that the characteristics of a landfill are primarily governed by the presence or otherwise of aerobic or anaerobic conditions. Clearly, on Day 1, all landfills start off being aerobic (there will be a plentiful surplus of air/ oxygen). 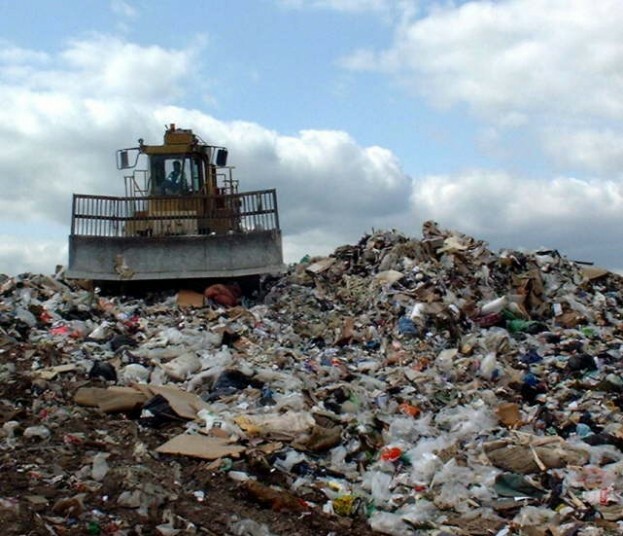 However, fairly soon all modern landfills become anaerobic in large parts of the landfill, as more waste is deposited above and around the waste. As more waste is placed around and on top of earlier waste, the ability of oxygen to diffuse into the waste-mass is lost within the body of the wastes. 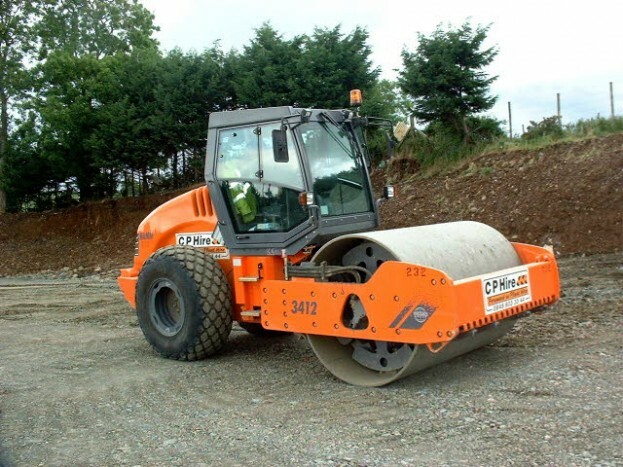 From that point onward a landfill becomes anaerobic and stays anaerobic for a very long time. The conditions within the landfill are very much governed by the presence or otherwise of anaerobic conditions, so let us consider the effects of this. Logically, all modern sanitary landfills will eventually, at some undefined future date, return to the aerobic state when all significant oxygen-demanding reactions have ceased. When the waste stops consuming oxygen a slow process of air-diffusion will allow the air/ oxygen to flow back-into the whole landfill, and not be consumed (i.e. return to being aerobic). This can be called the final rest state for a landfill. How Long is Needed for a Landfill to Cease to Pose an Environmental Risk? It is truly unrealistic to say anything more definitive than that this will take from hundreds of years, to one or more thousands of years. Printable version for those with Microsoft PowerPoint (Tm). Aerobic Waste Decomposition Means Mininum Bad Odours! Aerobic oxidation of organic matter produces no objectionable odor. If odors are noticeable, either the process is not entirely aerobic or there are some special conditions or materials present which are creating an odor. Aerobic decomposition or composting can be accomplished in pits, bins, stacks, or piles, if adequate oxygen is provided. Turning the material at intervals or other techniques for adding oxygen is useful in maintaining aerobic conditions. Anaerobic Decomposition is What Smells! Anaerobic decomposition results in a compost (often called a digestate) which can have a strong odor (and may need to be aired prior to using), it is not usually the first choice in compost for gardening home owners. The reason for that is generally that it has an unpleasant odor when first exposed to the air. High temperatures are needed for the destruction of pathogens and parasites. Suitable high temperatures can be created during aerobic composting usign the heat generated by the aerobic decomposition process. The destruction of pathogens and parasites more difficult in anaerobic digestion. The digestion process generates far less heat, and in all but the hottest countries to achieve this will need added heat, usually by burning some of the biogas produced by the process. Plastic waste is one of many types of wastes that take too long to decompose. Normally, plastic items can take up to 1000 years to decompose in landfills. Plastic products are very common in our modern life. According to estimates, every year in the US they use approximately 1.6 million barrels of oil just for producing plastic water bottles. But plastic bags we use in our everyday life take 10-1000 years to decompose, while plastic bottles can take 450 years or more. Just in the United States alone, every year more than 18 billion disposable diapers are thrown away. These disposable diapers take approximately 250-500 years to decompose in landfills. Hello, I was wandering around online and I saw your site from another site. In discussing waste decomposition your article, cleared up some confusion I was holding. I read a few of your posts and found them well written. Thanks, I will surely visit your page again soon.